In 1983 the film ‘Yentl’, directed by Barbra Streisand, was released. I was 23 years old. At that time I was a fan of hers for ten years. Ten years later, in 1993, I put some memories of happenings that surrounded the premiere of ‘Yentl’ into a MicroSoft Word document, titled it “Where is it Written?” and printed off some copies for friends. 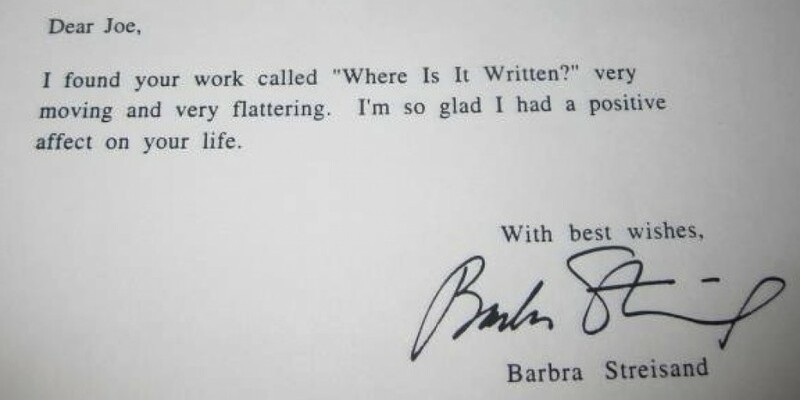 This document also found its way to Barbra Streisand. Along the way I changed computers, lost the floppy disk on which the manuscript was saved, and so on. I recently found a hard copy, and now, in 2013, 30 years after the premiere of the movie and 20 years after I first wrote it, I am now working with a MAC and catching up with the new technology. I have shared the chapters as posts, you can find the chapter index (called “Chapter Index”) in the black tool bar.. If you start at the beginning you can read the story the way it unfolded. Thank you for reading this far, and I really hope you enjoy the rest. All the chapters are now complete. I am now 53 years old. Best wishes, Joe Naughton. November, 2013.